I always have tons of questions about my photos on Wordless Wednesdays. So, in case you were wondering today I used Photoshop Elements 7. I resized my photos and dragged them into this free-style collage. 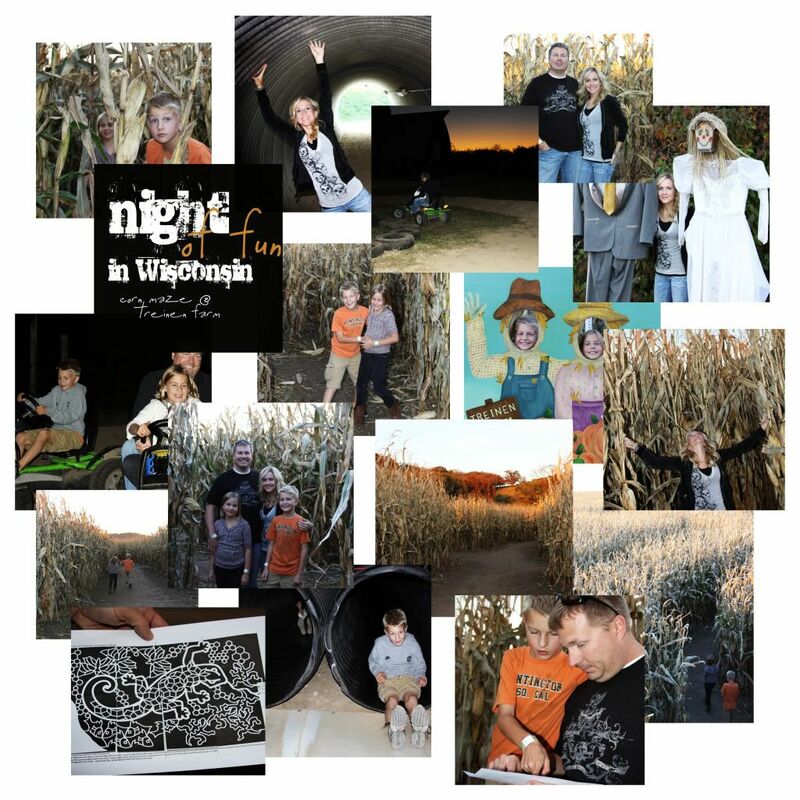 Easy peasy and fun for our corn maze pics. But in case you missed it, I was over at Kludgy Mom yesterday talking about all things photography for part of her Back to School Back to Blogging Challenge (B2S/B2B). Tons of great tips and links- free photo editing programs, techniques to enhance your photos, watermarking, and more. If you would like to spice up your photos or enhance your blog make sure to stop over and check it out. I'm happy to see ya here. Let's get this WW party started. Add your link below and then head over to some of my other bloggy friends... Kristi at Live and Love Out Loud, Amanda at Parenting For Dummies, and Susan & Janice at 5 minutes for mom. I love your pictures! I used to live in Madison and to this day, Wisconsin is one of my favorite places!! Great pics. I'll have to check out that post for some tips! great captures. that must have been fun. looks like you had a wonderful time! Great shots. Thanks for hosting and for all the great tips. I will be reading your article on Kludgy Mom and following links for many days. Maybe even learning something? I'll try. We have been playing in WI state parks. The campgrounds put on haunted trails and events during October. That's so awesome. I need to take a week off from life & responsibilities and learn Photoshop! My Wordless Wednesday is from a corn maze, too! You guys always have sooo much fun. I know I have said that before but it is true. Thanks for sharing. How do you have time to run your house, blog, do kids activities and do all that fun stuff? We don't seem to have as much fun as y'all do! Great collage. I love the collage - Happy WW!!! Quintessential fall. Lovely as always. Cute Phamily Photos. Thanks for hosting this version of Wordless Wednesday. I scrolled down to see your Tasty Tuesday entries and they got me laughing up a storm. Looks like tons of fun. The corn maze looks awesome. I especially like the picture from above and the fun cardboard cutouts! Looks like great fun! Lovely shots as always! I love how your collage turned out!!! We did something very similar this past weekend. Forgot my camera though. Doh! love the collage! Lots of fun pictures! I love the collage. Awesome! Corn mazes are always fun! I love the way you put your collage together... what did you use? Loving that collage! I am still a Photoshop virgin. I need to take the plunge some day! AH awesome photos! Looks like you all had a blast! I have Photoshop Essentials 8 and tried something similar but couldn't get the collage to work. I will try it again! This looks like so much fun! I really love your photography and look forward to it. Gorgeous collage, the photos are fabulous and it looks like you guys had a lot of fun! Thanks for the collage tip! It looks like you had a great time. Great collage Alicia. Beautiful capture of the season. That looks like a really fun place! We did something similar this past weekend and it's my WW post too. I will have to check out your photography post. I could use some help. We have a corn maze trip coming up! cant get more fall than that! What a fun day! I love the picture of you all as a family, it's definitely frame-worthy! Looks like you all had an amazing time!!! Wisconsin is such a beautiful state to visit. It is great to see you all having so much and so many pictures with happy smiling faces. Love the collage. great pics. I love how you always have such neat photo collages! Really really neat! What program did you use to create that? Photoshop? Happy WW! Looks like fun! Beautiful pics - as always!! I love the collage and I was just reading your guest post and your little shout out to me. I heart you! I love it! Nothing more fun than FALL!! Whew HOO! looks like you all had a really great time!!! Love the collage.. Looks like a great time was had. You're just too amazing, you know that? I love fall and your collage captured it perfectly. I need to learn how to do that. I use Lightroom but barely know how. Happy Wednesday! What wonderful memories you captured!! looks like y'all had tons of corn maze fun! thanks for the link-up & Happy WW! Thanks for the linky. Happy WW! Looks like a wonderful time was had by all. You got some great shots. Happy Wednesday! We just hit up the local corn maze... I cannot wait until my kids are old enough to have fun in the maze and not run off the entire time! YOu guys either have a lot of fun, or you just manage to capture every fun moment, or perhaps its both! I love your pictures. I have never been to Wisconsin, but I'd like to visit someday. Great photos. Happy day! OH! How fun! I love your collages! They are always fabulous! Looks like a fun way to spend a beautiful fall day! Great pics, looks like fun! Hope you enjoyed your time in Wisconsin! ;) Happy WW! Great pictures! I love the way you make collages with your photos, I need to try that! Photoshop Elements is so fun to use. Love the collage. I think we'll hit up the pumpkin patch next week. Love this time of year. SO I totally want to tease you about going to wisconsin to hang out in corn when you can do that in iowa. :) is that only funny to me? hahaha! just teasing! seriously wishing we had some amazing corn fields around us right about now. plenty of beaches... but definitely lacking corn. I love fall photos, especially those at the pumpkin patch!!! I haven't seen your post over at Kludgy yet, but I'm off to check it out!! Thanks for the tips. I use Paint Shop Pro 8 and it's a bit difficult to learn how to use it for making a collage or much of anything else. Thanks for the linky, happy WW! I certainly wish I knew more about photography. Holy cow! You cleaned house on comments this week!!! Wonderful collage. I typically like photos on black, but the white background here suits this fun set of photos so well. Just makes me feel happy! Thanks for stopping by my blog too! I love the name A Beautiful Mess - it reminds me of my life right now; having fun with my girls but what I lot I have going on! Fabulous Halloween/Fall collage! Hope you had a great WW! Looks like fun was had by all. Go Wisconsin!